← Auckland, New Zealand. January, 18th, 2012. 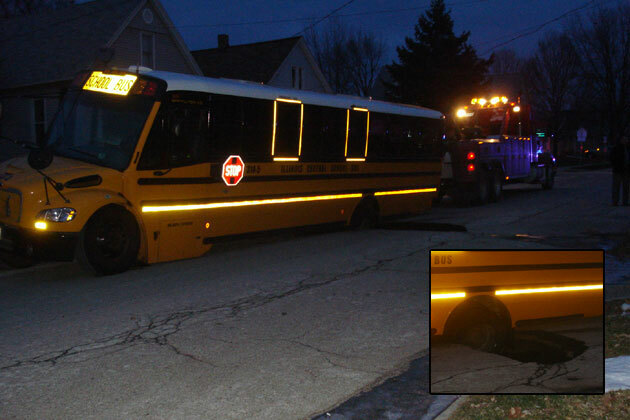 The sinkhole that swallowed the rear wheel of a District 87 bus Wednesday was caused by a water main break. Bloomington Water Department Director Craig Cummings said the main break caused some erosion of the soil underneath the pavement. “It is related a bit related to sewers and the fact that the water, because it was able to get into a sewer and run away, it never surfaced as you would expect a pressurized water main break to do,” Cummings said. To complicate matters, Cummings said there was a working fire in the same area Saturday night, and when firefighters opened a hydrant, a different main broke. A water department study of the condition of water main assets is coming soon. Cummings said after getting the problem areas and condition list of water and sewer lines, a long term plan with estimated amounts for repairs and replacements will be created. 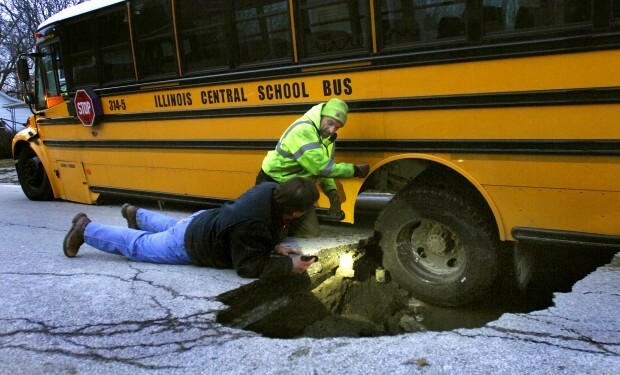 This entry was posted in Pictures, Vehicle v Sinkhole and tagged Illinois, school bus, sinkhole. Bookmark the permalink.